Nautical Adult 60th Birthday Invitations - Golden Starfish Invite Templates - Personalized Online! Nautical Adult 60th Birthday Invitations – Golden Starfish Invite Templates. 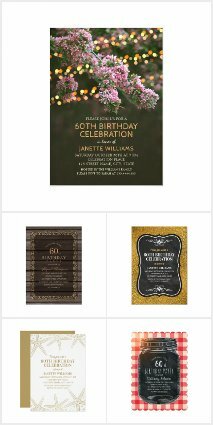 Unique and creative 60th birthday party invitations. Feature beautiful faux gold ocean starfish and air bubbles, chic typography on a white background. You can also change background color if you wish. This invitation is perfect for tropical beach, Hawaiian themed, destination birthday celebrations etc. Easily customize his birthday party invitation, just add your birthday party details (including age). Start with ordering your first sample.